Rock & Glow Unicorn Toy is rated 2.6 out of 5 by 27.
Who says you can’t believe in unicorns? 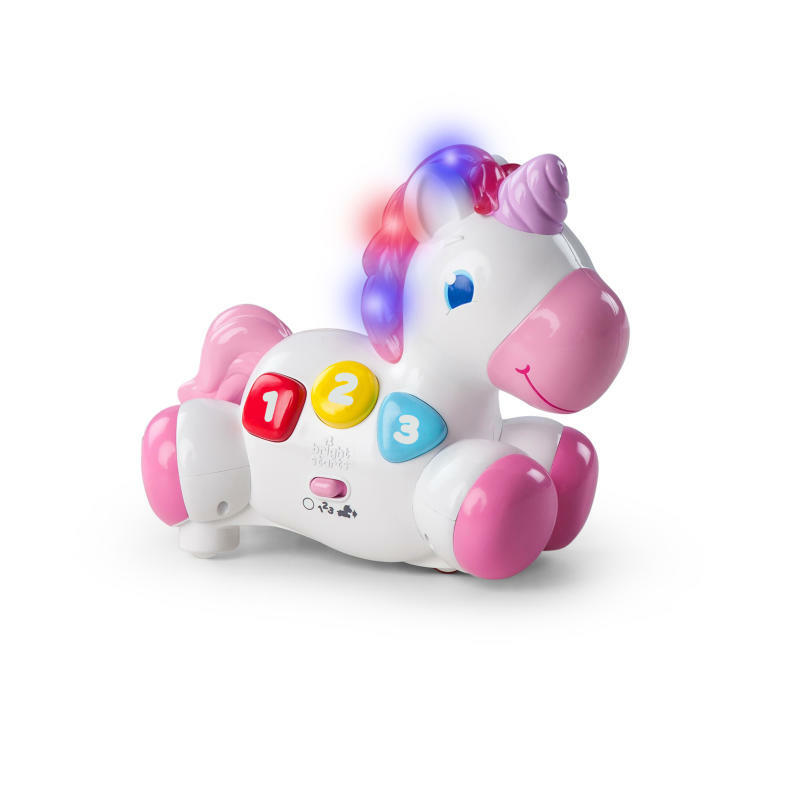 Get the giggles going with every gallop from the Rock & Glow Unicorn Toy by Bright Starts. With just a touch of the unicorn’s magic horn, the joy of playtime will begin! Whimsical lights, songs and sounds will follow the unicorn’s every move. Choose between two fun modes of play. Let your baby enter an enchanted world of colors, shapes and numbers in Discovery Mode. Or send baby flying after her fantastical friend as it races across the living room floor in “Chase Me” mode. Even carpet won’t slow this magical toy down! Get ready for lots of laughs, as this unicorn is full of surprises. When baby catches up, every touch will make the unicorn change directions – sending baby on a whole new chase! Your princess and her pretty pony will be off on a fairytale adventure. Unicorns have never felt so real! Dimension (in) 9.46" x 5.1" x 8.3"
Rated 1 out of 5 by Viv from English! Let's Play This unicorn won't move. It just says English Lets Play over and over. Even pressing the buttons and nothing happens. What a waste. Rated 1 out of 5 by Jessica Romero from So sad Got this as a gift for my baby but it doesn’t work new batteries and it won’t move. Rated 1 out of 5 by Jessica Romero from So sad Got this as a gift for my baby but it doesn't work new batteries and it won't move. Rated 1 out of 5 by Awilson from Stopped moving and rocking repeat "let's learn" Bought this for Christmas for my daughter and withing a couple weeks it stopped moving and rocking. And when its sitting and not being played with it repeats "let's learn" over and over. Couldnt return it as we had bought it early and the time to return it had expired. My husband took it apart to see if it could be fixed and turns out the little motor inside had burned out. Rated 4 out of 5 by ElleOC from Cute but not always functional Unicorn is adorable and my toddler loves pressing the buttons. The rocking/moving feature doesn’t always seem to work as it’s designed too— it gets stuck on carpet as sometimes doesn’t go at all. Rated 4 out of 5 by ElleOC from Cute but not always functional Unicorn is adorable and my toddler loves pressing the buttons. The rocking/moving feature doesn't always seem to work as it's designed too- it gets stuck on carpet as sometimes doesn't go at all.